Maresa with help from Elliot has started a new group ‘HobNobs: Getting Together to Talk or Not’. Elliot, Reva and Emma, all in their teens have written about why they want to be involved. Maresa “ I was really concerned about the isolation of young people who can’t talk and the fact that non-disabled young people hardly ever meet a young person who can’t talk. 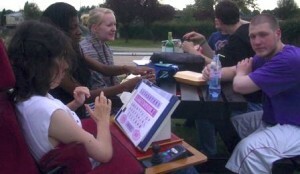 So in August 2008 we had our first meeting of eight young people altogether. Since then we have met approximately once a month. We have played games, sat and talked, played football, gone for walks and eaten in cafes. In December we had a musical evening with hidden talents emerging. Elliot “I knew a friend ( Yoshi) before he came to Bluecoat ( my school) and I was pleased when he came because I thought we could get to know each other better. Our (mine and Yoshi’s) relationship was going well at our ‘inclusive ‘ school but later on in our school life our relationship was hindered, rather than nurtured, by staff. The need to do something out of school came from being Yoshi’s friend. Having a friend on the autistic spectrum made me realise how he was being treated. It opened my eyes to what is happening behind the scenes. The way people are separated and treated. Reva I would never have known this stuff if I hadn’t met Maresa. I wouldn’t have known how much inclusion was needed and how vital it is. Meeting Maresa and knowing how important inclusion is…… it is life changing, I would never have known this without meeting Maresa. This entry was written by admin, posted on May 25, 2010 at 1:58 pm, filed under Activities. Bookmark the permalink. Follow any comments here with the RSS feed for this post. Both comments and trackbacks are currently closed.